We can assist you in the implementation of your hydric project, either to sell power to the grid or for own consumption. If you have a river, stream or creek on your land, make use of your water wheel or existing mill to generate power. If not, we can build or help you in the construction of one. Tell us the flow rate in cubic meters per second, the height of the water column from the surface to the level of the turbine and other specifications of your project. Based on this information we can design a cost effective solution adapted to your needs. We make stainless steel water wheels and casters. 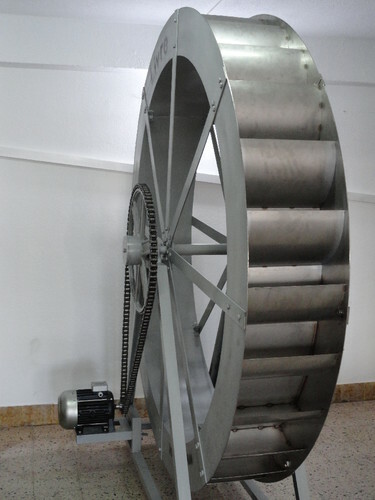 They are highly efficient and adaptable to your mill conversion project in micro hydro. The following picture show a Livre water wheel stainless steel standard 2.2 m diameter by 0.36 m.
Take advantage of water resources that nature puts at your disposal. We can work with you in the recuperation of your mill leveraging hydropower to produce electricity. We are the official representatives in Europe of the hydro turbines and generators manufactured by the ALTERIMA company. This manufactures has 60 years of operation and more than 18,000 installations in Brazil. We can assist you in deploying your hydric project. It can be used to sell power to the grid or for self-consumption. A hydropower system have in its constitution two essential components, the turbine and the generator. The first component is responsible for the transformation of existing energy in the water into mechanical energy, the second uses this mechanical energy to produce electrical energy. 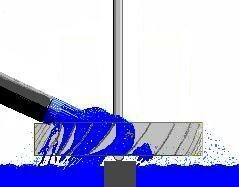 Alterima gives special emphasis to the turbines of action, Pelton, which are ideal for small drops and small flows. 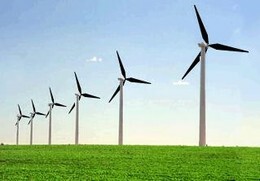 Conceived modules containing one or more turbines therein. These modules stand out for easy handling, installation and the low maintenance required for proper operation. There are many different possible configurations according to the user needs, which vary the number of Pelton turbines included in the module. Alterima generators have a 40% higher yield compared with the ordinary ones. These are permanent magnets and have a useful life of 20 years. They work with low rpm, 600/1200 rpm, and have two directions of rotation. These generators operate with only 20% of its rated capacity. For more information, consult "Alternators" tab on the product menu. Considering the good performance of the alternator, we have to take into account that the turbines also have an efficiency between 85 and 99%: This value may vary depending on the power output and the flow rate. The schemes presented below show schemes for the construction and connection of the alternator and turbine Alterima systems for production of energy. Watch a Alterima system running here. You may also consult the website of our partners by clicking here.